Weed doesn't have to be perect to be beautiful, do you see what I see? Three little stars in the middle of the dried weed! Barbara your images are so stunning, I like how you have done your editing on them. They look like the mist beautiful flowers ;) love the angle and how nice the photos became. and that goose egg with its crackled texture is lovely! Definitely your withered thistle is much more fascinationg than many other "perfect" blossoms or flowers. If you take your time to look closely to it. Photography, especially reduced photography is a way to focus to details the majority generally never takes into account. So you definitely did a good, even a perfect (?) job to focus on this little piece of imperfection. Have a great and peaceful Easter feast, dear Barbara. I love your last image - wow! Oh yeah weeds aren't perfect but I do love these and your photography shows why and the edits are just wonderful Barbara. Just beautiful!!! I love your photography work, and your words. Very elegant showing of weeds, but I love the colors and texture work! And the egg shell filled with flowers is absolutely adorable!!! I do agree with you - there's beauty everywhere if you look for it - even in weeds! Dank voor je reactie..hopelijk loop je eerdaags ook tegen een leuk eiersetje, gaat je vast lukken. Fijne Paasdagen en nog een fijne avond! Wens je een fijn paasweekend. 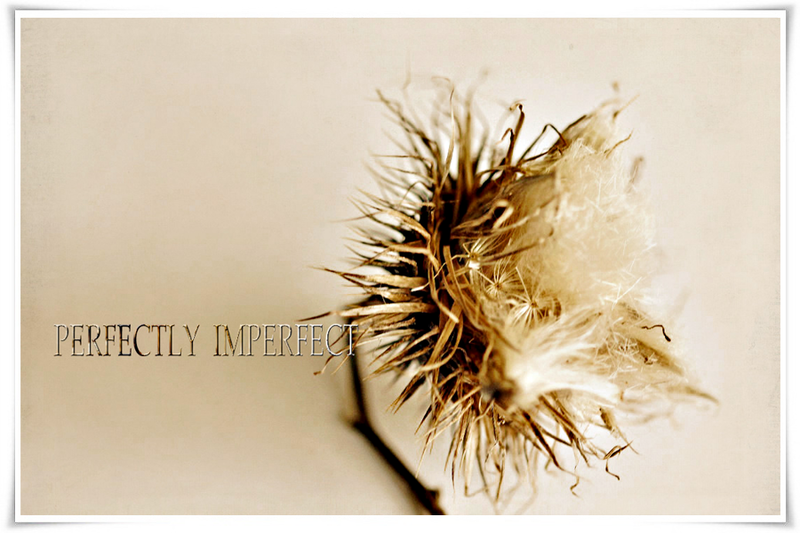 Perfectly imperfect, wat een mooi thema is dat Barbara. Fantastic egg with flowers. Wonderful "weed" photos. Zelfs van onkruid weet je nog perfecte foto te maken. Ik zie ook de drie sterren. Prachtig! Niet perfect maar daardoor toch perfect. De kamille staat er wel heel duidelijk op, prachtig, net als je andere foto's! Heel mooi het onkruid met de sterretjes, Barbara, perfect voor dit thema ! En het ei met de viooltjes ... wondermooi ! Oh so pretty, weeds and all, but I especially like the pansies in the goose egg, so so beautiful!! All lovely, and the flowers in the egg made me smile. So delightful! 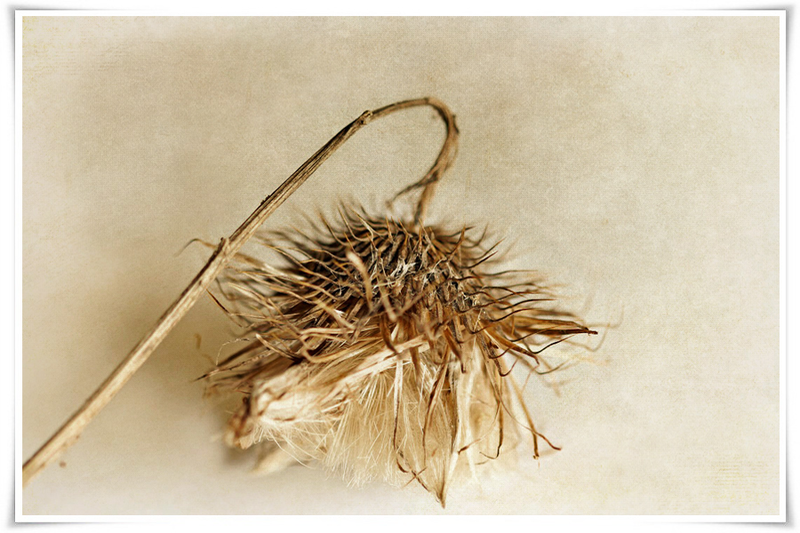 Oh, I love dried and crispy plants - perfect subject for Wabi-Sabi! and that little pansy pot - fantastic! so love your weeds! I am partial to weeds. your pansies have such a unique color. so pretty! Beautiful photos! Love how beautiful imperfect can be, very cool editing. Your photos are quite beautiful. Flowers just make me happy in spring. There is nothing more perfect than your little weed. The other flowers are beautiful too... so remind me of spring. 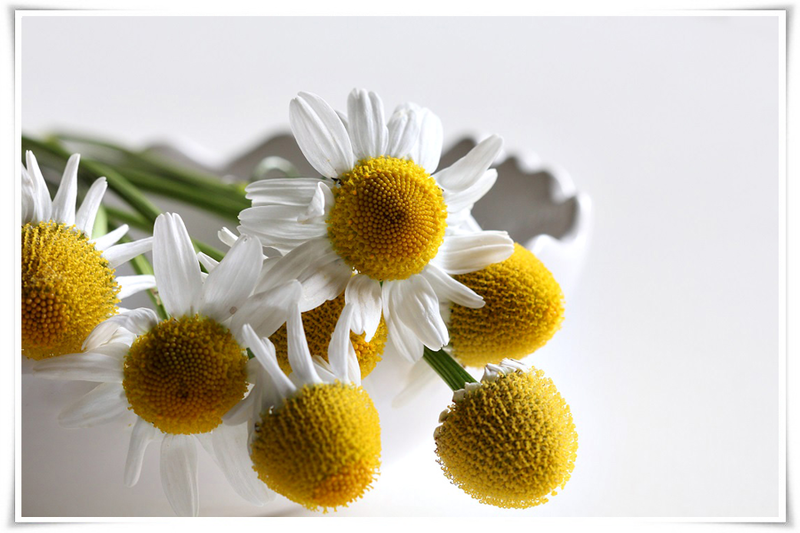 The wild chamomile looks so much like the daisy in this picture. I love how you find beauty in the imperfect things. Your pictures are wonderful, and I especially like the one with the flowers in the egg. Wat ontzettend mooi Barbara en ja die tekst spreekt me wel aan hoor, imperfectie doet niets af aan schoonheid..prachtig. Ik wens je mooie paasdagen toe. Your photos are full of beauty Barbara...There is certainly perfection in the imperfection, we must only be able to recognize it! All lovely...the perfectly imperfect weeds and the colorful flowers and easter basket! I love to photograph dried weeds, too! They really are beautiful. Love the violets in the goose egg. Beuatiful. Beautiful, each one is simply beautiful! You have an amazing talent for arranging the things you photograph. 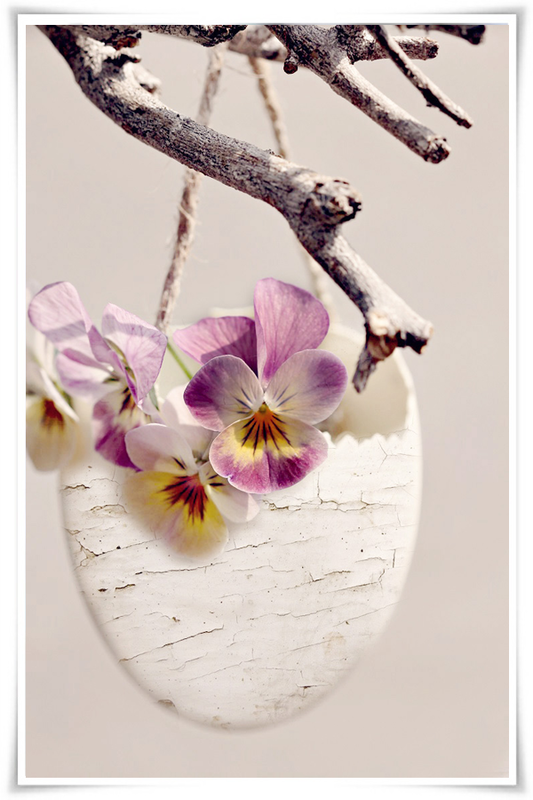 I love the hanging egg with the violets!